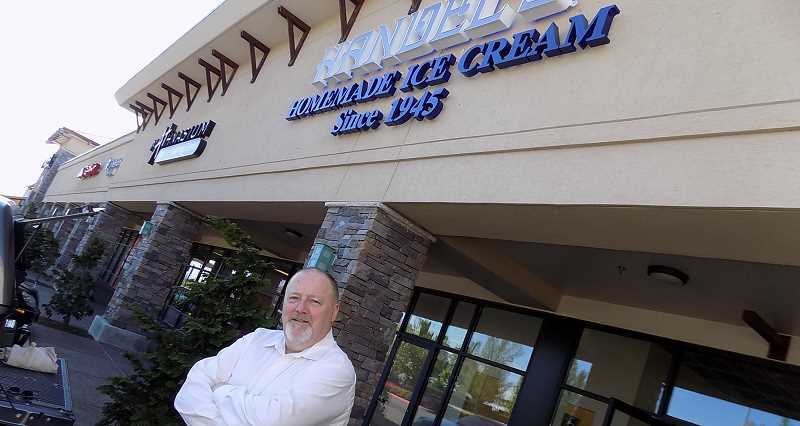 Tim Joyce will soon open the first Ohio-based Handel's Homemade Ice Cream franchise in Oregon, and more specifically, in Sherwood. On June 14, Joyce will open a Handel's at 21300 Langer Farms Parkway (in Langer Farms Plaza, next to Target). "It's from my hometown," he said. "I grew up in Youngstown, Ohio." A Lake Oswego resident, Joyce knows a thing or two about working for successful companies, having spent two decades as an executive with Nike. Having known the owner of Handel's Homemade Ice Cream for as many year, Joyce says he will add a few twists to a company whose first location was opened by Alice Handel in Youngstown in 1945. While most Handel's are walk-up operations, Joyce's store will include a 3,000-square-foot sit-down ice cream parlor complete with a party room designed for birthday parties and team events. Joyce said Handel's is known for several unique features. "No. 1, we don't skimp on ingredients and we don't skimp on quantity," he said. "At any one time I'll have 48 flavors." Another feature is that all the ice cream for the cones, banana splits, sundaes and shakes will be made in-house daily. "Homemade is really something I think people can get their hands around," said Joyce. On top of that, Joyce said he hopes to use Oregon's famed nuts and berries as ingredients. Several factors lead Joyce to locate in Sherwood, not the least being the location of his new franchise and the very strong demographics of the area. And so far, he's received nothing but support from everyone he's come in contact with. "The Sherwood community has been great; they've been very positive," he said, noting that "ice cream is fun." One of the incidents that lead to an epiphany to open a Handel's franchise came after chatting with a franchise owner in Redondo Beach, Calif. That individual told Joyce about the time he was visiting Ohio in the dead of winter and saw 20 people standing in the snow waiting for Handel's ice cream. "He said … 'I knew something had to be good about that product,'" Joyce recalled. Currently Handel's boasts 40 stores across the nation, the closest being four in California and one in Las Vegas. "My hope is to open a few more, locating in the Portland area," Joyce said. Handel's hours will be from 11 a.m. to 10 p.m. seven days a week. Call 503-822-5142 or visit Handel's Ice Cream Sherwood Facebook page.